I prefer baking breads at home so that I know the ingredients in my bread. Homemade breads are delicious fresh and have the best and healthiest ingredients. 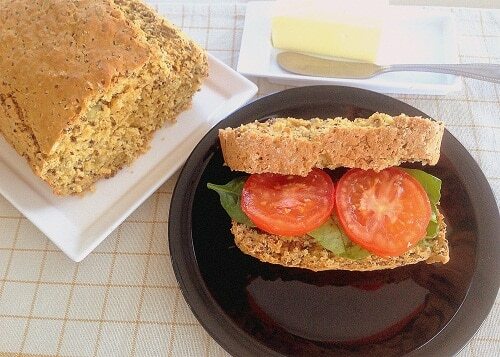 Lately I have been using Red quinoa quite a bit in my cooking and hence I wanted to try it in bread. It turned out to be healthy, filling and delicious. Red Quinoa Oatmeal Bread is yeast free, egg free and dairy free bread which can be baked in our home oven and no bread machine is required. Preheat oven at 400 degree Fahrenheit. Prepare the loaf pan with cooking spray and dusted. In another bowl mix all the wet ingredients. Spoon the batter into the pan and bake it for 50 minutes or until the toothpick comes out clean. Take the bread out of the oven and let it cool completely. Cut into slices and serve. Can be eaten as a sandwich or drizzle maple syrup/honey over it, or spread butter/cheese. Note: Cut into slices only after the bread has completely cooled down otherwise the slices may break and crumble. The above measurements would yield 1 loaf with 12 slices. Hi. This looks really good. Can I use (1) regular quinoa and (2) all wheat flour instead of oats flour and (3) does the bread come out dense? Yes, you can use regular quinoa. You can use only wheat flour also but the taste will vary slightly. If possible use rolled oats to make it tasty and yet healthy. Also you are right the bread comes out dense to a great extent. Just make sure to cool down the bread and cut into slightly thick slices since its yeast free and healthy bread. It will be very different form the white bread. Lovely. Would it be possible to use another kind of milk instead of flax milk please ? Hi Zoe, thank you for stopping by and showing your interest in my recipe. You can absolutely use any milk dairy/non dairy. Only be careful of the measurements and follow the directions diligently. Enjoy!